I am an only child, so it wasn’t easy at all for me to move to Israel 29 years ago and leave my parents behind in LA. When I came here in 1985 my father said that he felt like Yitro in next week’s parsha, who felt a mixture of sadness and happiness when the Egyptians drowned in the Sea. He told me he was happy and proud of me that I would live in Israel, but sad because he would miss me a great deal. For almost three decades I dreamed that my parents would come join me and my growing family in Israel, especially after they were already too elderly to take care of themselves. On several occasions, I would gather together the various documents to bring them to Israel, but again and again my mother decided at the last moment that it would be too difficult to make the trip. After my father passed away 3 years ago, I tried again to arrange for my mother to make aliya so we could care for her. But again, she felt unable to make the trip. 10 days later we were on the plane to Israel, it was a miracle. 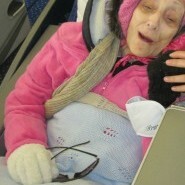 Savta Tirtza together with her granddaughter Devora on her aliya flight. My mother is an extremely wise and special person. She learned a great deal from her grandfather who was the Chief Rabbi of Amsterdam before the War. For many years she worked as a Hebrew teacher and she has always loved studying Torah. We decided to honor her by allowing her to name our youngest child, and she chose the name “David,” because she loves King David so much. Now my mom is finally surrounded by loving family, it so wonderful. I feel so thankful to Hashem for making my dream of 29 years finally come true. B”H, Mom has finally come home. what wonderful news!!!!!!! Mazel Tov!!! !